All names must be entered in the Names tab. To ensure that the software functions properly, each person or entity must be entered only once. Duplicate name entries must be avoided. Each name record must have an “identification type”. Select the dropdown arrow near the Type section for a list of options to choose from. Enter the information as requested. Choose the Get Committee Information here link to find other contributing committee information from the Bureau of Elections website. In the Employer drop down list select the Add New Name button as shown below. 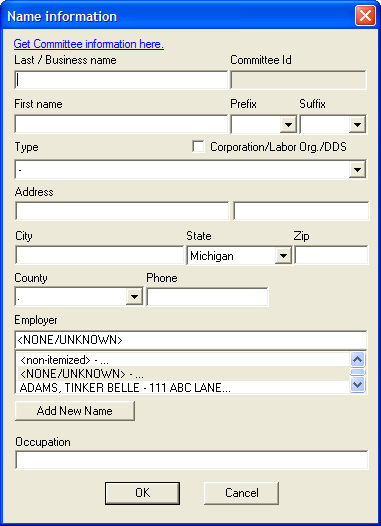 A new name information window will open to enter the Employer information. Note: It is recommended that all available information, such as occupation and employer name and address be completed at the time a name is entered, however, the name record can be modified at any time. Select Ok saves the entry and closes the window. Select Cancel closes the window without saving new entry. To Modify a name record right click on the record from the Names tab and choose modify as shown below to change the name information. 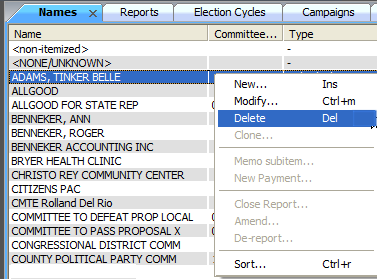 To Delete name record right click and choose delete from the Names tab. Please note if the name is associated with a transaction the name cannot be deleted.